Creating pollinator friendly landscapes can help in the effort to support local pollinators and improve pollinator health. There are several simple steps that can be taken to encourage pollinators in the garden.A lot of pollinator friendly plants are great landscape plants and may already be in your garden. 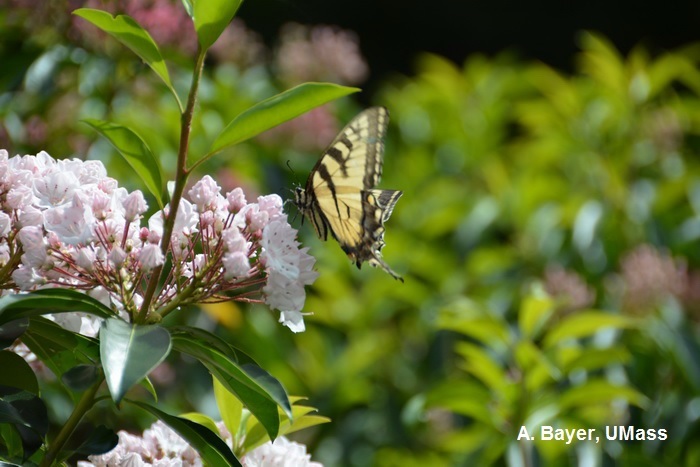 Diversity of plant material is important: trees, shrubs, perennials, annuals, fruit bearing plants, hedgerows, non-mowed areas, wildflowers, and grasses all support pollinators. Plant showy flowers as well as a variety of shapes, sizes, and colors. Have a sequence of flowers from spring to fall. Straight species generally have more pollen and nectar than cultivated plants. Double flowers often have less pollen and nectar than single flowers. Perennials usually offer more nectar than annuals. Wildflowers can be some of the best sources of pollen. Clumps or groupings of plants as well as repetition of species throughout garden areas helps support pollinator movement and keeps pollinator habitats from being too small or isolated. Pollinator friendly plants provide sources of nectar and pollen, foraging habitat, nesting areas and shelter, and food for larvae. 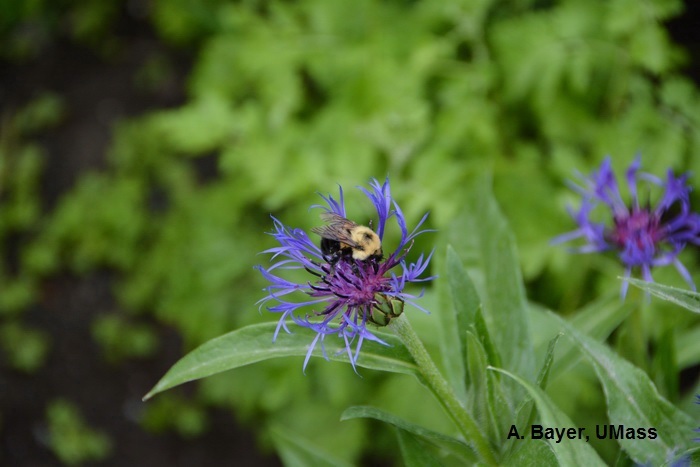 Provide areas for native pollinators – become familiar with your native pollinators and their habitats. Sunny areas are very important, but shade and part shade areas are needed for protection from inclement weather. Clean water sources are important. They can be provided with a birdbath, fountain, dripping faucet, small pond, mud puddle, or damp salt lick. Mix a small about of sea salt or wood ashes into mud to give bees and butterflies minerals. Change your landscape expectations – expect plant damage! Some life stages require pollinators to eat vegetation, so plan accordingly. Maybe consider planting these plants away from high traffic areas; this provides protection for pollinators and can hide damaged plants. Larval host plants are a must. Allow for pollinator friendly plants in turf areas. Be creative – there are many different possibilities outside of traditional home landscapes for supporting pollinators including containers and window boxes, community gardens, and wildflower meadows. Make sure that nesting materials are available. Nesting materials can include twigs, plant fibers, spider silk, lichens, leaves and catkins. Plants with fluffy or fuzzy fibers or foliage are also good for providing nesting materials including ornamental grass plumes, lambs ear foliage, fuzzy seedpods or soft casings. Have foraging and nesting areas close together. Provide sheltered nesting areas and overwintering habitats. Provide bare spots for ground nesting bees. funnel shaped flowers that often trap the flies! Limit the use of insecticides. Is the pest actually harmful to your plants? Use non-chemical, organic solutions when possible. When pesticide applications are needed. Use the least toxic chemicals, apply in the evening when pollinators are least active and avoid using when plants, including nearby weeds, are in bloom. Use pesticides that do not persist on vegetation. Use mechanical or manual control of weeds and invasive vegetation whenever possible – mowing, cutting, pulling, girdling, or tilling. Mulch to avoid weeds - lessen the need for chemical control. Use perennial ground covers for weed control. Have proper soil nutrition management – over-fertilization and over-irrigation can lead to excessive weeds. 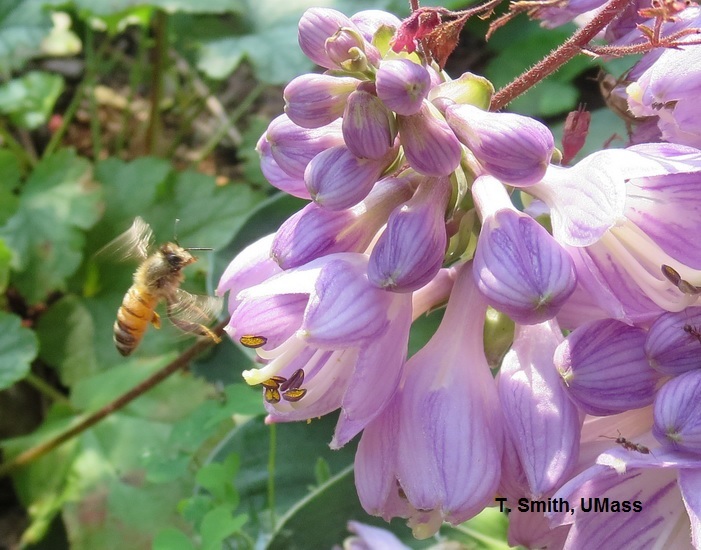 Leave some non-noxious species to enhance pollinator habitats. Limit mowing to every other week. Think about pollinators when doing garden clean-up. Pollinators use plants as overwintering sites. Wait to trim and prune until after pollinator emergence. Protect pollinator habitats – avoid stress or disturbance such as pesticides and mowing.